Carbon is a Hindi science fiction short film on global warming, written and directed by Maitrey Bajpai and Ramiz Ilham Khan. The movie stars Jackky Bhagnani, Nawazuddin Siddiqui and Prachi Desai in the lead roles. The movie is set in 2067, in an earth where Carbon is the gas in abundance and Oxygen is supplied by industries. Bhagnani plays a man with an artificial heart and Siddiqui plays the role of a man from Mars. The film will release on the YouTube channel of Large Short Films. "Most waited, an Indian Short Films #Carbon, is a release on YouTube #LargeShortFilms Yesterday. This short films also get more viewing in only one day up to 3.5 million plus. It Short Films Starring by Nawazuddin Siddiqui, Jackky Bhagnani, Prachi Desai and Yashpal Sharma. The Mini Film is about of future Hindi science fiction short film on global warming"
The makers might want to have us believe that Carbon is a dystopian sci-fi short about our polluted planet bereft of an atmosphere and full of desi oxygen smugglers. 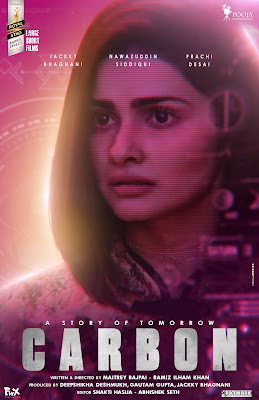 And that a hustler called Random (Bhagnani) meets a girl called Pari (Desai) in a dire situation, presenting us with a rejected Wall-E scenario that has nothing to do the PSA-style voice-over. Actor and producer Jackky Bhagnani has shared the first poster of his upcoming short film Carbon. The actor took to Instagram to share the first look and wrote, “A peak into the future! Presenting the official poster of #Carbon.” The film also stars Nawazuddin Siddiqui. Jackky revealed the first look on the 13th July at IIFA 2017 in New York. “As an actor and producer, the only way I know how to communicate with audiences is through the film. Carbon deals with serious environmental issues like Global Warming & Climate Change and their impact on our world. As a citizen of this planet, I think it’s time we stop talking and start doing. Carbon is my attempt at creating awareness and I’m thankful to IIFA for giving me this platform,” Jackky told reporters at IIFA. Starring by Nawazuddin Siddiqui, Jackky Bhagnani, Prachi Desai and Yashpal Sharma.